The Lotus 88 is for me a car that is the closest to what a perfect F1 car migh look like. It uses the ground effect, as it is a wing-car, but in a very revolutionary way. The car is build out of 2 chassis, which both perform the 2 different tasks of getting grip. The aerodynamic chassis (a bodyshell that moves allong with the suspension) gives the car its aerodynamic grip (downforce). By moving with the suspension, this chassis is not effected to rideheight, and always stays in the optimal angle to generate the most downforce. The other chassis is the one where the mechanical grip is made. Because the aerodynamic chassis doesn't push the car down too much, this mechanical chassis can be set up with very soft suspension. This gives it really good grip, especially in the slow corners, were the other cars of his time were loosing it because they needed a very stiff suspension. It also is much more confortable for the driver, as the other drivers from other teams had a very hard time in the cockpits, because of shaking. The Lotus 88 never really had the chance to prove itself, because the other F1 teams forced to get moving aerodynamics banned out of the rules. This brings back the memoty of Ferrari, when they used moving elements on the frontwing, just a few years ago. It looks like they want to do the same as what they banned themself because of the Lotus 88. I want to simulate ths car as good as possible. There might be some difficulties to overcome with the downforce. 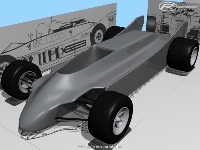 Therefor I would like to accept any kind of help in any kind of the progress of producing this car, especially physics. I hope that this project will get to the scenes of rfactor, I think it would be more then just a nice project, but also a prove of what this car COULD have done to F1, and the danger it could have brought with it. But beside that, I think it is a beautyfull car. please.. is this project finished? This is my all-time favorite formula one car too. Good luck and hope to see it on track soon!